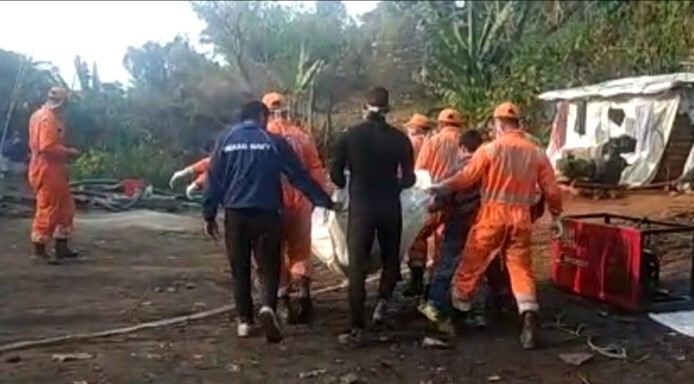 Indian Navy divers are facing obstacles in retrieving the second body of another miner from the coal mine at Khloo Ryngksan in East Jaiñtia Hills district of Meghalaya on Sunday. The body was detected inside the mine by the Indian Navy team on Saturday. Out of 15 miners trapped inside the coal mine since December 13 last year, only one body of miner from Chirang district was recovered and handed over to his family members on Saturday. As part of the operation, Susngi informed that the CIL pumped out water from two old shafts for 34 hours and the total discharged was 45,90,000 litres. “Due to some mechanical problem, the KSB pump was stopped and the pumping of water will continue soon after the repair is finished,” said Susngi. The Kirloskar works continued and installation of the platform in one of the old shafts was in progress. Pumping of water by Kirloskar is expected at the earliest. The National Disaster Response Force (NDRF) as usual coordinated their assistance with other agencies with all available resources. The body which was retrieved from the coal mine at East Jaintia Hills district of Meghalaya on Thursday has been identified to be of one Amir Hussain of Assam’s Chirang district. A senior district administration officer on Friday had informed that the deceased’s mother and wife identified the body.